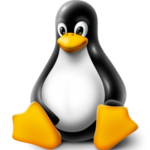 Linux uses environment variables that specify a set of values that affect the way the computer runs. The OpenFOAM configuration sets environment variables mainly to provide short-cuts in the use of OpenFOAM and to help with compilation of OpenFOAM. The short-cut environment variables generally begin FOAM_ whereas the compilation environment variables begin WM_. From the terminal, you can navigate around the file system, where files are organised in a tree of directories (folders). The home or top directory on the user’s file system is specified through the HOME environment variable, often /home/ (check by typing echo $HOME). The root directory of the entire filing system, including system files is typically denoted by / The current directory you are in is denoted by . The directory one level higher than the current directory is denoted by ..
Data is stored in files and with the filing system managing the names and hierarchies of files and directories. The copy command (cp) copies file data to a file with a new name. The move command (mv) simply renames a file or directory, or alters its location in the directory hierarchy, so involves no writing of file data. Sometimes it can be useful to print text files to the terminal. It can be useful to search through files for expressions using the grep command. The find command allows us to search quickly through files in the filing system. This starts the gedit application in the foreground of the terminal window. We now have no control over the command line prompt in the window. One way to regain control is to shut down the editor; a brute force way to do this, is to hit <CTRL-C> in the terminal to kill the process. Alternatively we could keep the process alive and hit <CTRL-Z> in the terminal. This will stop the process, allowing us to regain control over the command prompt. From there we could restart the process in the foreground by typing fg in the terminal, in which case we lose the terminal prompt again. Alternatively we can restart the process in the background by typing bg, allowing both gedit to run and taking control of the prompt. If we wish to execute gedit in the background from the start we can add an & to the command line on execution, i.e. The killall command can kill all gedit processess, e.g.